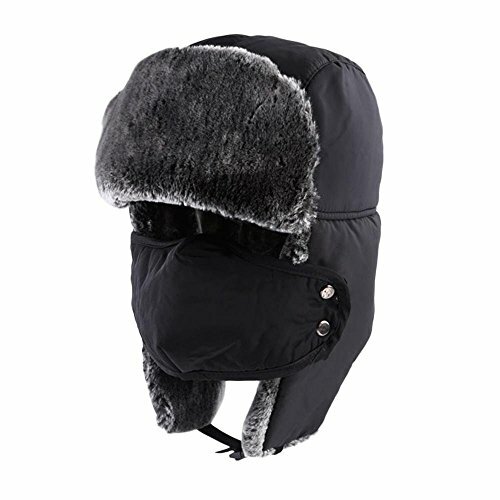 ☃ Winterproof flaps to cover the ears. ☃ Adjustable buckle to keep the ear flaps together. ☃ Removable nylon mask is windproof and sweat-resistant. ☃ Snap buttons on the sides to hold the mask in place. ☃ Ideal for skiing, hunting, ice fishing, etc. ☃ Materials. 100% polyester outer shell. Faux fur inner lining and brow. ☃ Soft, quilted and static-resistant interior. Fleece lining to keep you warm. ☃ Dimensions: Ear flap dimensions: 17.7 x 7 in. Mask dimensions: 10.2 x 6.3 in. Risk Free - Our Promise to You - At Etcbuys you will always be in good hands and buy with confidence because we offer a no hassle returns refunds. It's our Promise to you. No questions asked. It's that simple! STOP BEING AFRAID OF THE COLD: Would you love to hit the ski slopes or enjoy a day outside while staying warm and cozy...then you'll love how the Etcbuys Unisex Winter Trooper Hat's ear flaps and wind proof mask will easily and simply keep full face warm and out of the cold. EXTRA WARM FLEECE LINING: Are you looking for the perfect winter trooper hat that looks and fits you great. Making this hat an ideal outdoor winter accessory for skiing, snowboarding, ice-skating, chopping wood, wearing with flannel, even dog-sledding whatever your doing this winter you'll be warm and stylish ! If you have any questions about this product by ETCBUYS, contact us by completing and submitting the form below. If you are looking for a specif part number, please include it with your message.